Bub Peter Nguany is charged with murder in the death of Charles Raybine in March. ALFRED — An Old Orchard Beach man who is accused of fatally shooting a man in Biddeford in March pleaded not guilty Friday to a murder charge. Bub Peter Nguany, 25, was arrested within hours of Charles Raybine’s death as Nguany tried to leave his home in a taxi. He has remained in custody since his arrest. 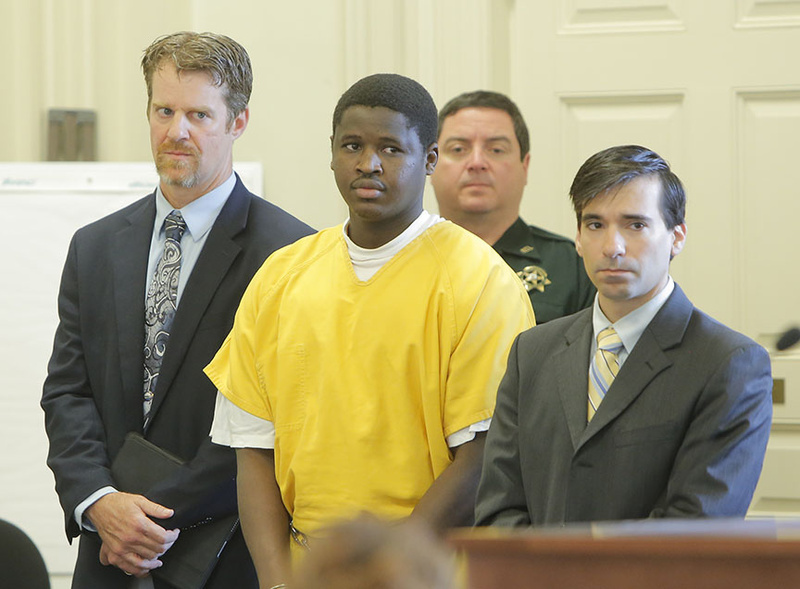 Friday’s appearance in York County Superior Court was Nguany’s first on the murder charge. He also pleaded not guilty to charges in two other cases, one from two days before Raybine’s death and the other from the morning after Raybine was killed. Nguany was arrested March 24 in a traffic stop on Saco Avenue in Old Orchard Beach and charged with two felonies: illegal possession of a firearm and aggravated operation of a vehicle after his license had been revoked as a habitual offender. In his arrest on the morning after Raybine’s killing, police seized bags of crack cocaine from Nguany and found a .45-caliber pistol and ammunition in his backpack, according to an affidavit police filed seeking a search warrant after the second arrest. Nguany faces two counts of aggravated drug trafficking and one count of illegal possession of a firearm from that arrest. The affidavit explains why police believe that property seized from Nguany is evidence in Raybine’s killing. Police were called at 1 a.m. on March 26 to Parish Place Apartments in Biddeford, where they found Raybine, 47, shot several times in the face with a .45-caliber handgun. Police said Raybine was a known drug user and, based on witness statements, was smoking crack cocaine and drinking while playing cards in an apartment at 41 Birch St.
At one point during the night, Raybine and his nephew, Morgan Palmer, went outside and sat in Raybine’s car, although the affidavit does not say why. Two cars pulled up, one on either side of the parking lot. Palmer told police that a man got out of the passenger seat of one of the cars, a dark Toyota Prius, and walked over to Raybine’s car. Palmer described him as 6 feet tall, 175 to 200 pounds, black, wearing a baseball cap and dark jacket, and possibly a hooded sweatshirt, the affidavit says. The man pointed to Palmer and asked, “Yo, who you with, who’s this?” the affidavit says. Raybine answered, “That’s Mo.” The man then fired a gun at Raybine’s face. An autopsy showed that Raybine died of multiple gunshots to the head and neck. Palmer ran away after the shooting and called 911. Old Orchard Beach police Officer Scott Jarrett heard the report describing the suspect, which matched the description of Nguany. The officer recalled arresting him just two days earlier, when he was driving a rented Prius with New York license plates. Marchese said Raybine had kicked his drug habit for many years but had developed drug issues again recently.